Our names are Alice Grendon and Dunan Herman-Parks. Alice is a third generation Quaker from Seattle, Washington. Dunan is a Pioneer Valley local and began attending Friends Meeting with Alice last spring, he has been a regular attender ever since. We are both Hampshire College students. We are both committed to living lives of leading. Which requires deep listening to where the grace found in silence points us. In February, 2016 Alice sent out an email to friends and acquaintances far and wide, asking if anyone knew of a farm back in Washington, or in the North East that the two of us could farm at during our summer break from school. Lots of people wrote back, including a Friend from Mt. Toby Friends Meeting who suggested several farms in the area, but at the end of the email mentioned the Nelson cabin. She mentioned that Woolman Hill board had been considering a farm residency but that wasn’t any clearly worked out or ready to go proposal. The two of us thought “That would be some very real life experience, would go into fall semester, and we’re not ready for that,” and shrugged it off. We let it go and continued to mull over summer, never really coming to anything, but always realizing that we couldn’t find clarity on what to do because we were not lead. Then on 16 March we were walking in the Hampshire woods, talking over summer for the thousandth time and Dunan said that the Nelson cabin kept coming up for him. As we talked more suddenly everything clicked in a very divine moment of powerful connection. Alice, who has been working on NED pipeline resistance since starting Hampshire in 2014, realized that this agricultural season directly correlates with Kinder Morgan’s (now former) proposed timeline of survey into construction. Remembering our time at Climate Spring II- hosted at Woolman Hill this past November, we connected that the cabin sits on the proposed pipeline route. And thus it all came together. Dunan looked at me- Alice- and said, “this is always what it comes back to isn’t it.” Living in love in the pathway of destruction. I got chills all up and down because this theme continues to rise again and again in our lives both together and as individuals. We knew – in that terrifying way of calling – that this was the next step in a young ministry*, still in the refining. Then after a month or so of writing proposals to the Board of Woolman Hill, and to Hampshire College, asking to take the fall semester as field study, on the very day the Board approved our proposal, we heard the news- THE PIPELINE WAS INDEFINETLY SUSPENDED! This is of course great news, but we were left confused. As is often the case with a leading, the thing you think you are meant to learn is different than what the Universe has in mind for you. But we continue to lean in. What we know to be true, is that this continues to be a witness to economic, social, and climate justice. We believe that by undertaking this project of re-establishing the Bean Patch, and living in Wally and Juanita’s footsteps we are practicing embodying our values. We are, like the Nelson’s did, attempting to live a life that removes the causes of war. A simple and humble life, one of just consumption and resource use. And most of all, a life of listening. We understand that we don’t understand, the workings of the Divine. So we must remain open to where Spirit moves us. *the word “ministry” within the Quaker faith typically reffers to the life calling of an individual, which often takes the form of spiritually informed actions -or in our case project- that reflect ones values. It does not typically mean the spreading of a particular gospel or creed. Woolman Hill is a Quaker retreat center, open to all, on a beautiful New England ridge-top. We create opportunities for people to connect with that of God in themselves, in others, and in the natural world. Woolman Hill provides simple, comfortable facilities for individual retreats and group gatherings. We offer programs which nurture spiritual growth and foster the values and practice of peace-making, simplicity, integrity, social responsibility, and stewardship of the earth. To foster, develop and strengthen the testimonies of the Religious Society of Friends by securing and maintaining suitable premises for holding Meetings for Worship, meditation and study, for retreats, conferences, seminars and other religious and educational activities. We are by no means the best people to tell you the History of the Bean Patch, or about the lives of Wally and Juanita Nelson as, sadly, we never knew them. But since we are walking in their footsteps it is the very least we can do to honor them, to give a little bit of their history here. Juanita met Wally in 1943 as a journalist, interviewing him when he was imprisoned for Conscientious Objection during WWII. The Nelsons did Civil Rights work in the South beginning in the 40’s, and helped organize some of the first freedom rides. They eventually moved north, and in 1974 settled on the small piece of land at Woolman Hill where they built – with the help of many supporters – their cabin and started the original Bean Patch. The Nelsons lived in war-tax resistance the entirety of their adult lives, founding the “Pioneer Valley War Tax Resisters.” Wally was known around town for the sign he carried proclaiming “I haven’t paid taxes since 1948.” The Nelson’s intended the Bean Patch to be in part subsistence for themselves, in addition to founding the Greenfield Farmers Market where they sold produce. They recognized that by living a life of self-sufficiency they were not dependent on, nor supporting the war economy of the United States. We recently found a sticker on the inside of the main entrance to the Nelson cabin which states, “Your Tax Dollars Arm the World,” a very small token left over to remind us of their work. 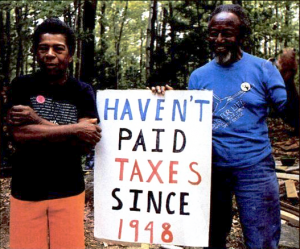 The Nelsons were actively engaged in, one might even say, a cornerstone of, the network of war-tax resisters and peace workers in the region. They are both remembered for their strong commitment to Non-Violence as a way of life, and embodying their value of peace by living a life that removed the causes of war. Wally passed away in March of 2002 at the age of 93. Juanita continued to farm for many years, with the support of many friends. As she grew older and less able, the Bean Patch ceased to produce crops for market and shrank to be only subsistence for Nita – as many called her. Juanita moved away from the cabin at age 90, living with various activist friends. We are told that folks would argue over who got to host Juanita, as she was deeply loved by many. Just last year, in March of 2015, Juanita passed away at age 91. 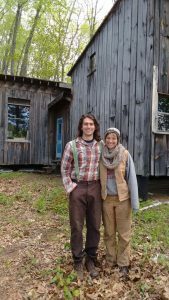 The Nelsons’ lifetime lease on Woolman Hill having come to an end, the Bean Patch gardens returned to grass, and the cabin now in need of significant repairs rests with the Woolman Hill Board and staff. We doubt Wally and Juanita foresaw anyone would take up their work, but this is a surprise to us too. We very strongly feel their presence in and around the cabin, and as we prepare the soil to again grow food.And have a very strong sense that we are indeed walking in their footsteps. We are attempting to do our best to carry forward their rich legacy of a life of embodied values and life of non-harming. The Nelsons set a high bar, as to living out your values, we hope our presence in their space will carry forward their consciousness.